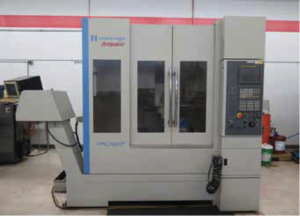 2000 Hardinge – Bridgeport VMC760 XP3 4-Axis CNC Vertical Machining Center s/n 310C162 w/ Fanuc Series 18i-MB Controls, 30-Station ATC, CAT-40 Taper Spindle, 10,000 Spindle RPM, Renishaw TS27R Tool Setting Probe, 24” x 39 ½” Table, Chick 25” x 41” Tooling Top Plate, Chip Conveyor, Coolant. Supermax MAX-1 Rebel CNC Vertical Machining Center s/n 805891 w/ Fanuc Series 0-M Controls, 20-Station ATC, CAT-40 Taper Spindle, Hand Wheel, 16 ½” x 33” Table, Coolant. Bridgeport 3-Axis CNC Vertical Mill s/n XT099 w/ BOSS PC Based CNC Controls,2Hp Motor, 60-4200 Controlled RPM, Bridgeport Rapid-8 Power Draw Bar, 30-Taper Spindle, Chrome Ways, 9” x 42” Table, (20) NTMB-30 Taper Tooling. Bridgeport Series 1 – 2Hp Vertical Mill s/n 243052 w/ Acu-Rite III Programmable DRO, 60-4200 Dial Change RPM, Chrome Ways, Power Feed, 9” x 48” Table. Bridgeport Vertical Mill s/n 274768 w/ Acu-Rite Programmable DRO, 2Hp Motor, 60-4200 Dial Change RPM, Chrome Ways, Power Feed, 9” x 48” Table. DoAll mdl. C-4 10” Horizontal Band Saw s/n 234-732303 w/ Speed Clamping, Coolant. Delta 14” Vertical Band Saw w/ Stand. Central Hydraulics 12 Ton Hydraulic H-Frame Press. 2000 Charmilles “Roboform 22” CNC Die Sinker EDM Machine s/n 230060 w/ Charmilles Controls, Erowa Electrode Tooling Base, 4-Station Tooling Rack, 11 ¾” x 15 ¾” Table, Walker 6” x 12” Magnetic Chuck, SHP Fire Protection System, Coolant Filtration System. Graziano Tortona SAG12 12” x 32” Geared Head Lathe s/n 117099 w/ Newall C80 Programmable DRO, Inch/mm Threading, Tailstock, Yuasa Tool Post, 5C Collet Closer, 10” 4-Jaw Chuck, 8” 3-Jaw Chuck, Coolant. Hardinge mdl. HC Hand Chucker s/n HC-2960- H w/ 125-3000 RPM, 8-Station Turret, Trava-Dial, Power Feeds, 5C Collet Closer. Harig mdl. 612 6” x 12” Surface Grinder w/ Acu-Rite Qwikcount DRO, Walker Magnetic Chuck. Harig mdl. 612 6” x 12” Surface Grinder w/ Acu-Rite DRO, Walker Magnetic Chuck. Deckel mdl. SO Single Lip Tool Grinder s/n 85-22776 w/ Diamond Wheel, Collets, Cabinet Base. Rockwell Pedestal Carbide Tool Grinder. Craftsman 1”” Belt / 5” Disc Sander. Kitagawa TecNara 4 th Axis 10” Rotary Head. Hardinge / Bridgeport 4 th Axis 5C Rotary Head w/ Servo Controller. Fadal VH5C 4 th Axis 5C Rotary Head s/n 2451193 w/ Servo Controller. 15” and 12” Rotary Tables. 5C Collets, R8 Collets and Tooling. Insert Turning and Mill Tooling, Drills, Taps, Reamers and Endmills. Vidmar 13-Drawer and 9-Drawer Tooling Cabinets. Bridgeport Low Gear Power Axes Drive Unit. Starrett Digi-Chek 18” Height Master. Mitutoyo 18” Dial Height Gage Peacock 1.5”-2.5”, .75”-1.5”, .37”-.75”, .25”- .39” Dial Bore Gages. Mitutoyo .44”-.72”, .3”-.4”, 35mm-100mm Dial Bore Gages. South Western Ind. Magnetic Base Setting Fixture.